Dominik Mieth studied film, literature and philosophy in Tübingen and Mainz focusing on screenwriting, narratology and ethics. After working in game development for six years as producer and game designer he became professor for game design at the Mediadesign University of Applied Sciences in Munich in 2012. 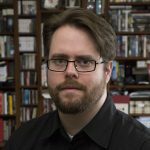 His lectures cover game design and documentation, game rules and mechanics and the history of games and game development. The presentation discusses three projects completed by Game Design students at the Mediadesign Hochschule München. It presents lessons learned from implementing gameplay for VR. Key findings cover interaction and interface design, virtual presence and immersion. How did the students use VR to create a novel experience? How did the students expect players to (re)act? How did players with little or no previous VR-experience react? What can this teach us for future VR games?